An “interceptor trench” dug in an effort to keep a plume of hydrocarbons from reaching Parachute Creek near the Williams natural gas processing plant. Contaminated groundwater in the trench is being sucked out into the truck in the background. So far, over 140 barrels of such water has been captured. The director of the Colorado Oil and Gas Conservation Commission sought to reassure Pitkin County commissioners on Wednesday that appropriate actions were being taken to contain, and find the source of, a mysterious plume of hydrocarbons threatening Parachute Creek. “They are taking appropriate response actions to identify the source of the release, to clean it up, to keep it from reaching Parachute Creek if at all possible, and hopefully taking actions in the future to prevent similar incidents,” said Matt Lepore, the director of the COGCC, about the two companies involved in the incident — Williams and WPX Energy, a former Williams subsidiary that owns the land where the leak was found. The location of the plume of liquid hydrocarbons, which the EPA has referred to as “oil,” is 4 miles northwest of the town of Parachute. The plume is 50 feet from Parachute Creek at a point 5 miles above its confluence with the Colorado River. 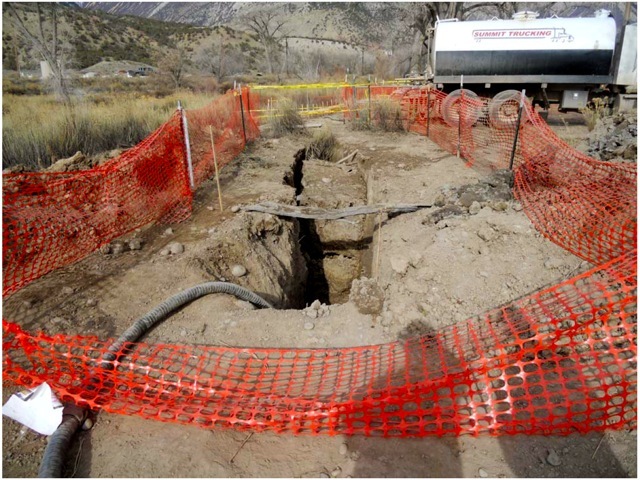 Contaminated groundwater was discovered on March 8 as crews were digging a trench for a new pipeline just west of Williams’ natural gas processing plant and east of the creek. The source of the plume and the substance in it are still unknown. Samples from the creek were taken on Friday, March 22 at the site of the leak, both upstream and downstream from it. Testing results released Wednesday by the COGCC found “no detection of petroleum hydrocarbons” in the creek’s waters. As of Tuesday, 143 barrels of impacted groundwater had been sucked out of an interceptor trench dug near the plume. And while a “sheen of hydrocarbon has been observed, no measurable amount of liquid hydrocarbons have been collected” since late last week, according to an update on Tuesday from state officials. Commissioner Michael Owsley told Lepore, who was in Pitkin County to talk with local officials, that it sounded as if Williams and WPX were “self-regulating” themselves in handling the incident. Lepore said the COGCC is the lead regulatory agency on the incident and has had either an environmental protection specialist or an engineer on the site every day since March 15, except for two days. He said a “level of decision making” has been left to the companies, but the COGCC is reviewing those decisions. “Why hasn’t it been fixed?” Owsley asked about the plume. “Well, to fix a release, you need to know where it is coming from,” Lepore said. In an interview after the meeting, Lepore said crews from Williams have inspected two pipelines in the area, a 30-inch line bringing natural gas products to the processing plant, and a 4-inch line leading away from the plant. Crews dug up 130 feet of the 30-inch line and found nothing wrong. They ran a pressure test on the 4-inch line and found it to be intact. Natural gas wells in the area of the plume also have been pressure-tested and show no signs of anything amiss, Lepore said. “A few obvious sources have been eliminated,” he said. On Wednesday, work was focused on a “valve box” connected to the 4-inch line running from the processing plant, as the soil around the valve box was found to be saturated with hydrocarbons. Special crews trained in handling hazardous materials had to be called in to dig up the saturated soils. Lepore said officials are using the relatively generic term “hydrocarbons” to describe the substance of the plume because the exact substance has yet to be identified. He added that in an industrial process like natural gas production, things do go wrong. Documents, maps and photos describing the incident are being posted on the COGCC’s website. From the home page, click on “images” and then select “projects” from the “type” drop-down menu. Then type in the project number, which is 2120. Then hit search. Editor’s note: Aspen Journalism and the Aspen Daily News are collaborating on coverage of regional land and water issues. This story has been changed slightly from the printed version to clarify the status of WPX Energy and the extent of Lepore’s visit to the Western Slope.